Satelytics is an industry innovator in imagery analytics providing spatial constituent concentration derived from spectral imagery. We are able to provide valuable data to our clients using imagery analysis techniques, trained scientists, and proprietary algorithms processed with issued US patents. At Satelytics, it is our priority to be on the cutting edge of technological developments so we can provide our clients accurate, cost-effective imagery products as quickly as possible. Advances in satellite and computer technology have made the utilization of these images in the enhancement of water quality more effective than ever. Current earth observatory satellites in conjunction with new image acquisition platforms, such as “nano-satellites”, will empower us to acquire high-resolution, low-cost imagery with frequent revisits. We combine the datasets from the sensors on these platforms with sophisticated machine learning technology and algorithm development to detect and classify objects on the ground more accurately and quickly than with human-based observation. Today, Satelytics is able to easily and accurately identify solutions that improve safety and quality of bodies of water, and we are leading in the implementation of transformative water quality enhancement technology. Satelytics employs a four-step process in the identification and remediation of water quality issues. This four-step process has been proven to be successful in several cases. We are able to accurately and efficiently identify problems and find solutions that benefit both our clients and the environment. 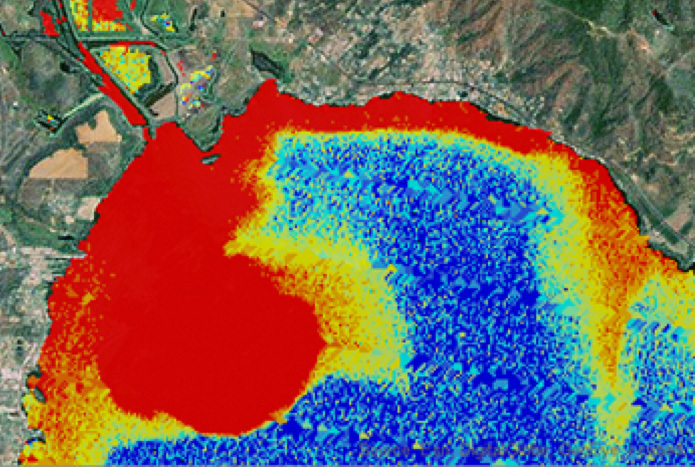 Identify the Issue – Satelytics utilizes satellite imagery and our unique algorithms to identify the concentrations of contaminants in bodies of water. Isolate the Source – We are able to use our imagery, algorithms and scientists to locate the land areas contributing nutrients to bodies water. Recommend Solutions – Our scientists analyze point-source problems and recommend partnering solutions that may include multiple abatement practices and remediation strategies. Monitoring Program – We develop a plan to continue monitoring mitigation efforts to determine effective implementation. Satelytics recommends several approaches to using satellite imagery to help improve water quality in our clients’ specified bodies of water. A phosphorus assessment example is included below. Satelytics can obtain historical satellite data ranging as far back as 1984 and utilizes it to analyze point-source phosphorus pollution. The use of satellite imagery over a multi-year historical period is required for conducting trend analysis to determine where the “hot spots” exist for phosphorus in the watershed. This is achieved using multiple images over a predetermined time period. To enhance the utility of the phosphorus imagery Satelytics studies other surrogates throughout this period related to high phosphorus such as chlorophyll-a and cyanobacteria. Hot spots can be identified through trend analysis, during both high flow after heavy rain and normal flow conditions. Correlation of higher constituent concentrations in water with land location hot spots yields significant information into areas of interest. We will map out a satellite imaging strategy as part of the fast track monitoring plan and a necessary step moving forward to quantify improvement of bodies of water, percentage reductions in phosphorus, and the success of mitigation strategies. This big-picture approach allows assessment of remediation effectiveness by truly observing the entire water body. After an imagery assessment is conducted the most effective remediation strategies can be increased, and the non-effective strategies discontinued. Petit Lac St. Francois in Quebec, Canada experienced significant issues with high phosphorus resulting in Harmful Algal Bloom (HAB) problems. Satelytics utilized satellite data and topological maps to reveal particular farms—indicated with the arrows below—were high on a hill with a valley connecting them to Petit Lac St. Francois. After we identified a source of the problem, the remediation strategy selected was the construction of phosphorus remediation berms around these farms and application of non-phosphorus fertilizer. Satelytics processed imagery analysis provided the means to focus remediation efforts on a high impact area. Farms on a hill northeast of the lake (left), phosphorus accumulation in the lake (right). Clear Lake in California has historically had major HAB problems. Clear Lake is a very large (43,000 acre) lake with thousands of acres of land draining into the lake. With such a large region, locating the origins of phosphorus is quite difficult using ground sampling. Our client was compelled to determine where phosphorus runoff originated after a high flow rain event. Satellite imagery revealed higher concentrations of phosphorus in the northern portion of the lake’s watershed. These processed satellite images illustrated areas on land where phosphorus remediation would have significant impact. 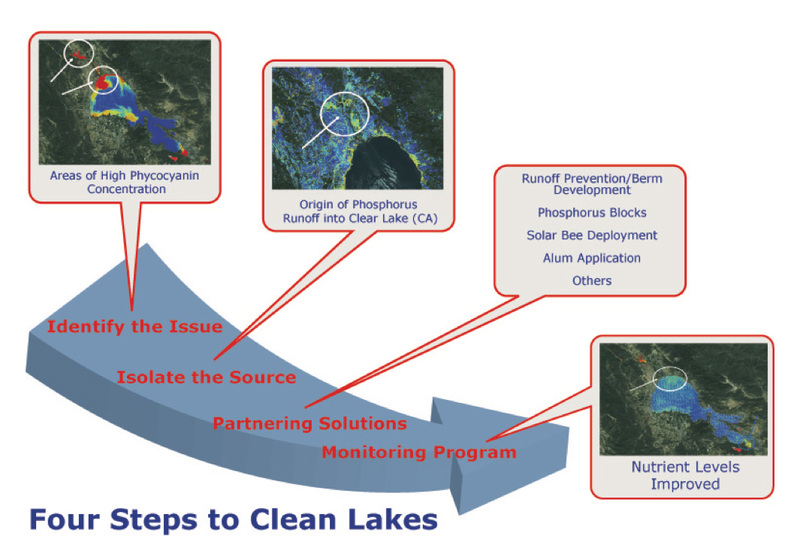 The remediation strategy for Clear Lake is ongoing; however Satelytics generated a macro view of total phosphorus in water and a micro assessment by conducting a pixel analysis. This emerging technology allows lake managers to better view and understand the true dynamics of lakes and their watershed systems. Phosphorus problem in Clear Lake California Watershed. Red is high. Dark blue is low. Satelytics can help cut costs while providing reliable, precise data that you need to improve the quality of your water. Your team will have access to the most current information available on the status of your water—at your desktop, on your tablet, or on your smartphone. For more information please visit www.satelytics.com or email info@satelytics.com.